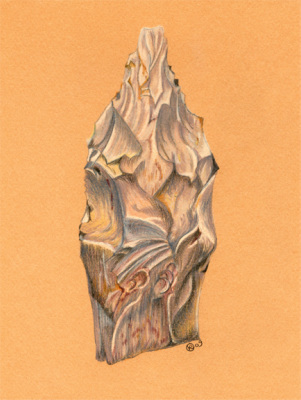 Véronique is an artist, scientific illustrator, geologist, and educator. Her artwork is inspired by her curiosity for and exploration of the processes that shape the natural world and the life it sustains. Since childhood, her personal and professional paths have integrated science and art. She first studied geology in her native France. And later had the privilege to explore and map underwater volcanoes in the deep Pacific Ocean during a research career in marine geology at the University of Washington. She has published maps and illustrations of the seafloor in scientific journals, oceanography and biology textbooks, and geology trade books. Her scientific rendering of a large hydrothermal vent adorns the permanent exhibit “Why is Earth Habitable?” at the American Museum of Natural History in New York. Véronique holds a BS in geology from the University Paul Sabatier in Toulouse, France and a MS in geology from University of California in Los Angeles. She completed the Natural Science Illustration Certificate at the University of Washington. She currently runs Ocean et Terra Studio in Seattle and uses a variety of media to create her art. She has exhibited in the Pacific Northwest, France and the UK since 2009.